EUR/JPY is trading at 128.33, up 0.14% on the day at the time of writing. The pair has been rejected at 110-EMA and has seen a steep fall on Friday's trade as poor data overshadowed easing concerns regarding Italy's budget. A below-forecast China's retail sales, industrial production data amplified fears of a global growth slowdown. Further, the dismal Eurozone services and manufacturing surveys further added to the malaise. On the data calendar today we have the Eurozone trade balance and the November CPI, scheduled for release at 10:00 GMT. Europe's CPI reading early today could see broader markets take a turn for the risk-averse if inflation measures confirm traders' fears about an economic slowdown. The pair finds major support at 127.85 (Trendline), break below could see further weakness. Scope then for test of 78.6% Fib at 126.66. On the flipside, immediate resistance is seen at 5-DMA at 128.51. Bearish invalidation only on decisive breakout at 110-EMA. 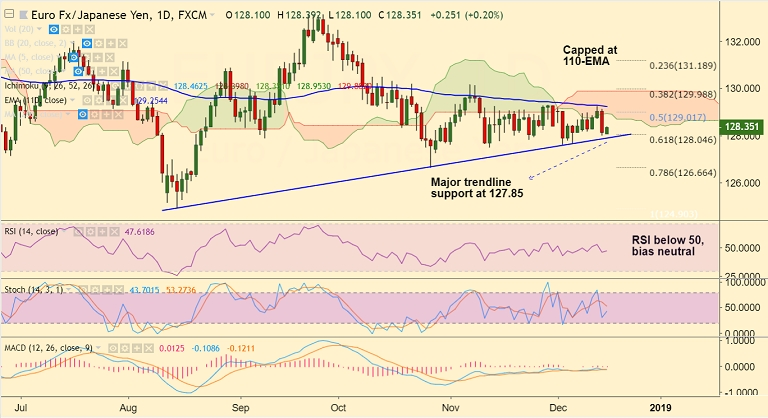 Recommendation: Stay short on break below major trendline support at 127.85, target 127.60/ 127/126.70.